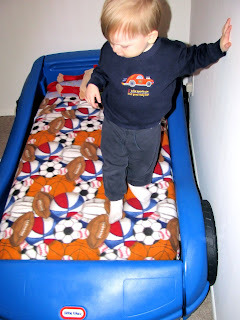 The Toddler Bed...dun, dun, dunnnn! A lot of you asked me to keep the blog updated with my toddler bed adventures. I told each of you that I would be SURE to do just that. I even have a "bestie" who's going to be facing the "toddler bed adventures" during her husband's time off this Christmas too. The plan was set in our house. We would face the challenge come the evening of December 23rd. On December 24th, we are heading to my in-laws and need to bring the broken down crib to store in their basement. We have no room to store it here. The hubster and I started talking about it more and more as we came closer to our set date. Would Alex freak out? Would he get out of bed 1000 times and keep us up all night? Would he decide he likes his bed so well that he sees it as another place to play? The questions were endless. The stress level was high. The hubster dropped a bomb on me Thursday evening. "Why don't we just start Alex in his bed on Friday? That way he'll get most of the kinks worked out before Christmas." "Hah...as in TOMORROW, Friday? You want to start tomorrow? Oh, man. I'm not ready for tomorrow! "OK, you're right. We'll start Saturday evening." Well, I was obsessing even more about Alex's big switch from the crib to the toddler bed. Then, I remembered that my brother's officially returning home from his duty in Iraq on Sunday. (He's been in Texas going through his medical check-ups and such.) There's a ceremony scheduled for the early afternoon. "Hun," I said when he returned from work, "I think we should start Alex in his bed tonight. What if he has a really rough time and then has to go to the ceremony on Sunday? He's never going to make it through the day." I moved around some things in Alex's room to make sure there weren't any super fun toys out for him to play with. When everything was in it's place and Alex's bed was put together, I let him in the room to check it out. As I watched him play on his bed, I did "it". I did the mom thing. I cried like a baby. I couldn't believe he was big enough to have his own bed. I'm such a sap. How's it going? Well, um....I'm hesitant to say this. I don't want to get my friend's hopes up. It's going perfect. Last night was a tad bit rough. Alex cried pretty hard when we left him in his bed. Mike sat in his room with him until he fell asleep. Sometimes Alex just needs to know that someone's going to be there for him so one of us will sit on his floor until he's calm and sleeping. Alex never woke up and he actually slept in a little. Nice. Today, we had to face our first nap time with the new bed. I tucked Alex in and left his room. Again, he started crying. I looked at the hubster and pouted a big pout. Then, Alex suddenly stopped crying. HE STOPPED CRYING! YAH! AND, he went right off to sleep. Wonderful. About an hour ago (8:30), we put Alex to bed. Did he put up a fight? No. Did he lay down and go right to sleep? DING, DING, DING! YES! AMAZING! I'm SURE there will be days when Alex will think it's play time and try to run around rather than sleep. I'm sure I will have fun stories to tell about Alex in his big boy bed. For now, though, there is only peace. Peace and a good night's rest. Here's to our Christmas Miracle! Cheers! Congrats! That is awesome that he is doing so well! We moved my son to a toddler bed too soon and it was a 1 1/2 year nightmare until he finally slept by himself. I will send good luck wishes your way. Yey that is wonderful, Jack is an excellent sleeper but only in his crib so to think about big boy beds freak me out. Yay! You and Alex and dad! I think his first cries was his way of getting used to the idea and wanting to know if mommy and daddy would still be there and if he is ok. I remember getting those when I started my son on his bed...but I started off with naps in the afternoons for about a week and then it just transitioned. Suddenly he wanted to sleep goodnight in his own bed. Congrats! We'll be getting a big girl bed soon. I'm keeping her in the crib till her feet stick out the end, though. So she might be 5 or 6 before she gets a real bed! Our transition was equally easy - sure there are "not so great" stories, but for the most part it was a very smooth transition. when they're ready, they're ready you know? what a big boy!! hugs, mom! Hooray, does this mean you're ready for a new baby?? ;) I didn't know when to transition for Aves, she just turned 19m. we'll probably keep her in for a little while longer. I laughed when I read this about hubster dropping the bomb about starting the bed thing on Friday! You know you have to WORK up to these things..... I pray everynight is a perfect as that first night for you! That bed thing is HUGE- it takes lots of planning to get there- I am finding much joy in reading this- I sooo remember this and still going thru IT!!!!! I personally am an advocate for them to stay in the crib until their feet and head tough! That way I ALWAYS know where they are! Feet and head Touch not tough- oops. That's great to hear!! Yay!! We're making the switch soon...I think it's a bigger transition for us as parents than it is for them.